The Society strongly supports the development, which will make a major regeneration contribution. Bristol was the first city in Britain to build an electric tram service. 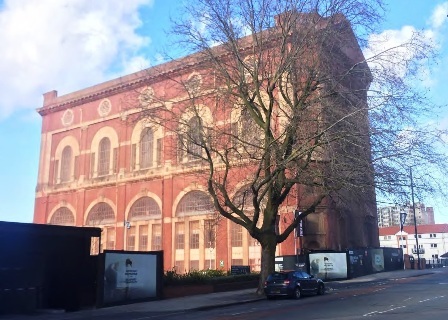 In 1899 the Grade II* listed Generator Building was opened to supply power to the trams. Curtis Green was the architect; he later built the Chiswick Power Station, Scotland Yard and the Dorchester Hotel. War damage closed the tram system in 1941. In the 1980s the Bristol Brewery converted the building to offices. Cubex, who are developing the Finzel’s Reach development, wish to renovate the building and remodel the office interior. The elevations are flamboyantly built from red brick with limestone ashlar dressings. The building had an innovative steel frame. The interior surfaces are glazed with ceramic bricks. The grand Counterslip entrance has a splayed, coffered central arch enclosed within a massive Venetian window case. The development gives the opportunity to reopen the currently sealed entrance to create a dramatic entry and maximise the building’s street impact. There will be no significant exterior interventions. Can the developers ensure that space is provided to allow the peregrines that have nested on this building for a number of years to continue to use it. The sight of these top predators are an inspiring sight in middle of a large city.